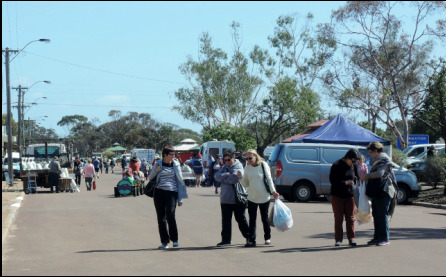 Indulge yourself at the famous Nungarin Wheatbelt Markets (held between 8 am and 12 pm on the first Sunday of each month except January and February). At each market 35 - 45 market stalls are set up in the Nungarin Town Hall (and the Mall between the Nungarin Town Hall and the Shire of Nungarin Offices) as well as along the length of the town's main street. Children always enjoy free rides on the train that loops up and down the main street on Nungarin Wheatbelt Market Sundays. Visitors can take a break from shopping and relax with a bacon and egg roll from the Sausage Sizzle or enjoy a sumptuous morning tea at the hall. Alternatively drop into Wegner's Rural for real coffee and a home made sausage roll or head up to the Woolshed Hotel for a pub lunch. The Nungarin Heritage and Army Museum is open every market day from 8 am to 12 pm and the amazing heritage listed Mangowine Homestead (located 14 kilometres from Nungarin) is also open from 10 am to 4 pm.. The cost of a stall at the Nungarin Wheatbelt Markets is $10 and all stall holders are provided with a free trestle table. Nungarin Wheatbelt Market volunteers deliver sausage sizzle breakfasts to stall holders from 7.30 am onwards. Volunteers also bring a free cup of tea or coffee to all stall holders on the tea trolley at around 8.30 am on Wheatbelt Market Sundays.